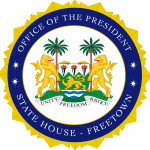 State House, Freetown, Thursday 15 November 2018 – French Ambassador to Sierra Leone and Guinea, Jean-Marc Grosgurin, has paid a courtesy call to His Excellency President Julius Maada Bio at his State House office in Freetown. Ambassador Grosgurin said that he was happy to have travelled all the way from Guinea, where he resides, to not only strengthen the bilateral relationship between Sierra Leone and France, but to also discuss the future of the two countries, especially around key projects and investments. In appreciation, the President expressed gratitude for the visit and described it as one that he had been looking forward to since he took up the office in April, adding that the two countries had come a long way. He also told the French Ambassador that his government was committed to working with the people of France on economic diversification like marine resources, and trade and investment from very credible investors.